A great gallery featuring many covers. Offering Golden Age covers and stories on affordable CD-ROMS. A magazine about comics from the 30s-70s. Includes great reprints. Publishers of Golden Age Men of Mystery and more. Well, I hope you enjoyed the third issue of Pure Excitement Comics. If you missed the first two issues, the first is now back online here and number two will be back soon...I promise! The next "issue" should be on-line sometime around November 15, so check back then! I also plan to have a Golden Age Gallery, featuring images and info about other "lost" and "not-so-lost" characters from that era, online by the end of October. In the mean time, send in those letters to bnolan@bit-net.com. Your letter may be published in a future issue! Dear Bill, In case you don't know (and you may already), the artist on the Target story you reprinted was Joe Certa. Keep 'em flying! Thanks for the info, Lou! I always appreciate any input of this kind. I have a very limited knowledge of Golden Age artists, so information like this is helpful. Hi Bill, First off I really like your webpage. I too am an avid fan of G.A. Super-Heroes, the only problem is I can't afford those old comics. So when I saw your page it was like a ray of light, here I could read old G.A. stories and it would cost me nothing. So I thank you. Something I would like to see is a gallery of the more obscure characters (any chance that may happen?). One of the reasons being that I to customize Action Figures and have no resourse material on some of the characters I read about in a book called "Encyclopedia of Super-Heroes". I hope you consider this suggestion. That's exactly why I started this online reprint 'zine -- to expand the audience for these great characters. Darrin's suggestion was also what inspired me to start work on an online gallery (coming soon!). Darrin is actually working on a gallery of his own. I will post a link to his site once it is up and running! Hello Bill, I certainly have enjoyed both"issues" of your on-line fanzine (or is it web-zine?) I personally would rather see the mysterymen type character, although aviators/spacemen are sometimes interesting as well, unfortunately, I thought Whiz Wilson not to be to my type of strip and I didn't enjoy it as nearly as much as the Target & the Targetters, and the Face. I really enjoyed the Chameleon strip from the first issue, especially the "Kid Tyrant" element! Now there was a big surprise! One more golden age character to add to my list! More of this please! This brings me to the subject of "back Issues", you see I told several of my friends about the Kid Tyrant character and lo and behold, when they went to check out your site it was gone! As it had been replaced by the second issue! Imagine my surprise. Anyway I did manage to draw the character before he dissapeared and I color coded him so in a way I still have him. But try when you can to offer those back Issues to us so we can enjoy them over and over. That's the nice thing about "HoooHah! ", you can always go back and reread the articles and reprints. Suggestions for future issues I would leave to your better judgement, though the more obscure the character the better. Anyone who is truely interested in the Goldenage, will probably have a good working knowledge of the "big guns", but anything you come up with will be consumed by me with great glee. Thank you for putting out such an oustanding piece of work,it's obvious a labor of love,and it shows. Keep 'em flying! (Wow, two "Keep 'm flying" notes in the same issue!) Richard, yes, this web site is a labor of love and I thank you for your kind words. I'm sorry you didn't enjoy the Whiz Wilson tale from last issue. It's not what I typically plan to feature in Pure Excitement Comics, I just thought it was neat. You can be sure that every issue of this web-zine will contain at least two stories about costumed crimefighters. The third story may feature something a little different, such as Marvo the Magician this issue, but nothing too dissimilar. Also, in response to requests from Richard and others, the first issue is now back online. There is a link to the location a few paragraphs up. Richard was also kind enough to mail samples of his great artwork to me. He's currently working to draw every single costumed hero of the Golden Age. I will have a few examples of his artwork on this site at some point in the future. He's also working with Darrin from the letter above on their gallery of Golden Age heroes. Well, that's it for this month. Before you leave, check out this issue's Golden Age Cover Gallery below. See you next month! 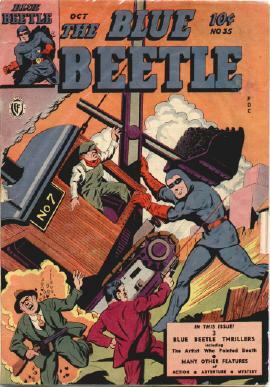 In the Gallery this month is a classic Blue Beetle cover, from issue no. 35. Artwork originally ©1944 Fox Feature Syndicate, Inc.